Jul 7, 2009 - 32, 189 (1984). 11. H. McQueen, Mater. Sci. Eng. A 387â389, 203 (2004). 12. M. Barnett, G. Kelly, and P. Hodgson, Scr. Mater. 43, 365. (2000). Oct 15, 2012 - and Jonas (Ref 35) to determine rc from a plot of the derivative of the work .... J.I. Gutierrez, F.R. Castro, J.J. Urcola, and M. Fuentes, Static. 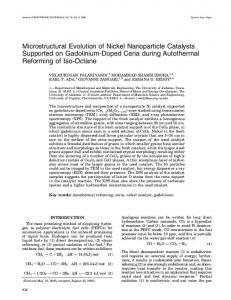 Jul 7, 2009 - Dynamic Recrystallization (DRX) as the Mechanism for Sn. Whisker ..... regime and annealing treatment for all strain rates. The half-error. S.L. Semiatin, D.S. Weaver, R.L. Goetz, J.P. Thomas, and T.J. Turner. SEPTEMBER 2006. Approved for public release; distribution is unlimited. STINFO COPY. cessed by rapid solidified powder metallurgy (RS/PM) has excellent mechanical properties with high yield strength (YS) of 610 MPa and elongation of 5% at room temperature . Its high strength was thought to be due to strengthening by grain refinement, solid solution, fine Mg24Y5 compound particles, and introduction of a high density of plane faults caused by the formation of the LPSO structure . 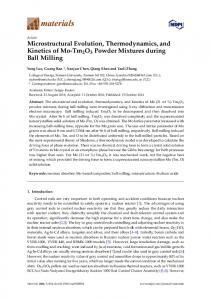 Deformation kinking has also been found to play an important role in both the strength and plasticity of the Mg97Y2Zn1 alloy . The Mg97Y2Zn1 alloy processed by extrusion and equal channel angular pressing (ECAP) obtains ultrafine grain size and exhibits excellent mechanical properties . However, the potentially dangerous powder process of RS/PM is not acceptable for the production of commercial products, and ECAP cannot be easily scaled up to the commercial production of large structural products. In particular, these kinds of processing are costly compared with thermo-mechanical processing, which is a commonly used way to fabricate automobile and aerospace parts at a competitive cost. It is well known that thermomechanical processing of the Mg alloys, such as extrusion, forging and rolling, is very effective. In addition, hot extrusion is a practically promising way to produce Mg profiles. The strength and ductility of Mg alloys can be improved significantly due to the fine grains associated with dynamic recrystallization (DRX), texture, and dynamic precipitation . Grain refinement based on an understanding of the dynamic recrystallization mechanisms during thermo-mechanical processing has made a significant contribution to improving the strength of Mg alloys. 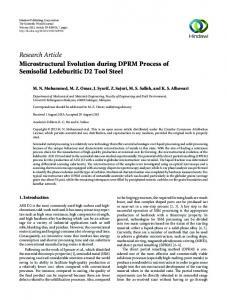 The DRX of magnesium alloys has been investigated by many researchers [12-16], and an understanding of DRX is essential to obtaining desirable microstructures and mechanical properties. 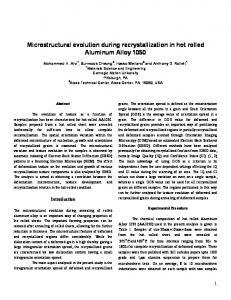 The aim of the present work is to study recrystallization and microstructural evolution during hot extrusion of the Mg97Y2Zn1 alloy. We discuss the influence of the extrusion temperature on the microstructure and mechanical properties of the Mg97Y2Zn1 alloy the relationship between the microstructure and the mechanical properties. Fig. 1. Optical micrograph of as-cast Mg97Y2Zn1. 2. EXPERIMENTAL PROCEDURES The Mg97Y2Zn1 alloy was prepared by electric melting of high purity Mg, Zn and the Mg-Y master alloys under a protecting gas (0.3%SF6 and 99.7%CO2) in a steel crucible and casting them into a steel mold. The ingots were homogenized at 833 K for 12 h and then air cooled. Hot extrusion was done with an extrusion ratio of 10.24:1 at different temperatures from 623 K to 773 K. The tensile tests were conducted on a Zwick electronic universal material testing machine at room temperature. The compositions of the alloys were determined by an inductively coupled plasma-atomic emission spectrometry (ICP-AES). The phase analyses were carried out with a D/max 2550V X-ray diffractometer (XRD). 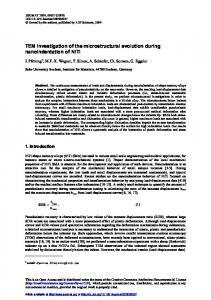 The microstructure was characterized by optical microscopy (OM) and transmission electron microscopy (TEM). The specimens for TEM were prepared by grinding-polishing the sample to produce a foil of 50 μm thickness followed by punching 3 mm diameter disks. The disks were ion beam thinned to a thickness of electron transparency. Fig. 2. An X-ray diffraction pattern of the as-cast Mg97Y2Zn1 alloy. Fig. 3. The microstructure of Mg97Y2Zn1 alloy after extrusion by different temperatures (a) 623 K, (b) 673 K, (c) 723 K, and (d) 773 K.
Fig. 4. 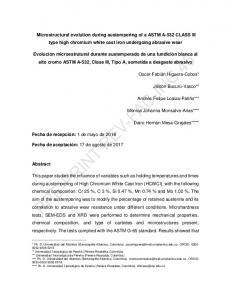 Comparison of the tensile properties of as-cast and extruded Mg97Y2Zn1 alloys after extrusion at different temperatures. Fig. 5. Typical appearance of the end from extruded sample. high temperature exhibited lower strength because the strain strengthening was balanced by the softening that originated from full DRX. With an increasing temperature, the strength decreased and elongation increased because more and more tangled dislocations were decreased by DRX. 3.3. Microstructural evolution analysis In order to investigate the microstructural evolution during extrusion, the microstructures of nine areas were investigated at the end of the extruded sample, as shown in Fig. 5. The microstructural evolution of the samples extruded at 623 K and 773 K were analyzed as follows. Figure 6 shows the microstructural evolution of the Mg97Y2Zn1 alloy during the extrusion at 623 K. The figures from (a) to (i) in Fig. 6 correspond to areas 1 to 9 in Fig. 5, respectively. Figures 6(a) and (b) illustrate that, even before entering the deformation zone, significant microstructural changes had occurred: twins are clearly apparent, which was due to high pressure being applied by a plunger. The profuse twins appeared in original grains due to limited available slip systems at a relatively low temperature. At area 3, a few small recrystallized grains nucleated along some original grain boundary areas and twinned areas. The original grain boundary areas and twinned areas had much higher stored deformation energy than the matrix and therefore were favorable nucleation sites for DRX. However, the fraction of recrystallized grains was negligible and no significant grain refinement took place. Figures 6(d)(f) illustrate that, with increasing strain, the volume fraction of recrystallized grains increased progressively. Besides the equiaxed grains, the original grains that appear to be elongated toward the extrusion direction indicate that DRX remained incomplete even when extrusion processing was complete. However, the fraction of these original grains was much smaller than that of the recrystallized grains, and it did not exceed 20% on average. At areas 7-9, the material had left the deformation zone, but the grain size in some non-recrystallized areas was refined further due to the static recrystallization (SRX) . Fig. 6. 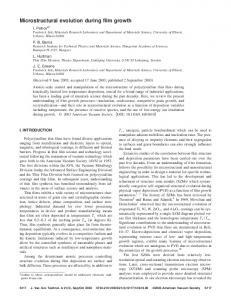 The microstructure evolvement of Mg97Y2Zn1 alloy at (a) area 1, (b) area 2, (c) area 3, (d) area 4, (e) area 5, (f) area 6, (g) area 7, (h) area 8, and (i) area 9 during extrusion at 623 K.
Fig. 7. The microstructure evolvement of Mg97Y2Zn1 alloy at (a) area 1, (b) area 2, (c) area 3, (d) area 4, (e) area 5, (f) area 6, (g) area 7, (h) area 8, and (i) area 9 during extrusion at 773 K.
indication that the extruded microstructure is inhomogeneous. Figure 9(a) shows a bright field image of a fully recrystallized grain that was obtained at 623 K. As can be seen from Fig. 9(a), there is fine lamellar structure inside the grain. The SAED pattern shows that the extra reflection-spots formed a lighter bright line in the c*-direction, which can be identified as an LPSO structure . Its dark field image is shown in Fig. 9(b). Figures 9(c) and (d) are dark field images taken under two-beam diffraction conditions using g=0110 and 0002, respectively. The dislocation density is quite high in the grain with a well-developed LPSO phase. Once dynamic recrystallization had taken place and new grains had formed, the dislocation density decreased sharply at these locations. Due to the incomplete recrystallization and inhomogeneous deformation in the alloy, the density of the dislocation inside the recrystallized grains became larger with an increasing strain. When the dense LPSO phases and the tangled dislocations had formed in the whole grain, it was difficult to distinguish the types of dislocations. It is apparent from the interaction between the LPSO phase and the dislocation that the LPSO phase contributed to the strengthening of the alloy. Figure 10(a) shows a bright field image of a fully recrystallized grain in the specimen extruded at 773 K. The characteristic striations of the LPSO phase are seen in the whole grain as was observed in the alloy extruded at 623 K. Figures 10(b) and (c) are dark field images taken under two-beam diffraction conditions using g=0110 and 0002, respectively. It is notable that there is no dislocation and all dislocations can be distinguished as dislocations in the grain. Fig. 8. 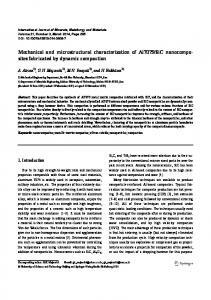 Microstructures of Mg97Y2Zn1 alloy extruded at 623K. (a) a area with big recrystallized grains, (b) a area with fine recrystallized grains and non-recrystallized grains, and the corresponding SAED pattern. Fig. 9. (a) Bright field image of a fully recrystallized grain that obtained at 623K. (b) Dark field image of the same area in (a), showing the LPSO structure in contrast extra reflection-spots in SAED pattern. (c) and (d) Dark field images of the same area in (a), showing the high dislocation density in contrast g=0110 and 0002 with B//, respectively. Fig. 10. (a) Bright field image of a fully recrystallized grain that obtained at 773 K. (b) and (c) Dark field images of the same area in (a), showing the non-basal dislocations in contrast g=0110 and 0002 with B//, respectively. the (0002) plane of pure Mg. Therefore, the precipitates can be identified as an LPSO structure with a hexagonal crystallographic structure. The mixed type precipitates reveal that the 14H-type LPSO structure coexisted in the 2H-Mg with certain crystallographic relationships of (0001)2H-Mg//(0014)14H-Mg. This was explained in a previous study by the authors [19,20]. The grain boundary precipitates have pining effects on grain boundary motions as shown in Fig. 12. Fig. 11. TEM analysis of extruded Mg97Y2Zn1 alloy. (a) TEM micrographs and corresponding SAED pattern of Mg97Y2Zn1 alloy after extrusion at 773 K, (b) is an enlarged part of (a) for clarity. Fig. 12. TEM analysis of extruded Mg97Y2Zn1 alloy. (a) TEM micrographs of Mg97Y2Zn1 alloy after extrusion at 773 K, (b) is an enlarged part of (a) for clarity. from 3 μm to 8 μm with increasing extrusion temperatures from 623 K to 773 K. Both DRX and SRX, which occur during and after deformation respectively, were observed. (2) The alloy that extruded at a relatively high temperature exhibited lower strength because strain strengthening was balanced by the softening that originated from full DRX. (3) Three types of morphologies, namely, big recrystallized grains, fine recrystallized grains, and non-recrystallized grains, were observed in the extruded microstructures obtained at 623 K. The dislocation density was quite high in the fully recrystallized grain. 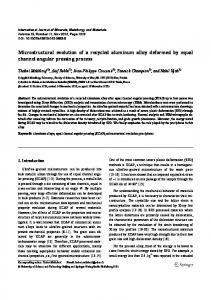 The extruded microstructures obtained at 773 K were composed of large grains with more uniform size. Their degree of recrystallization was higher and the dislocation density was also decreased. All dislocations in the grain were distinguished as dislocations. (4) The dispersing of submicron scale precipitates were distributed along the newly formed recrystallized grain boundaries and had a remarkable pinning effect on the recrystallized grain growth after extrusion at 773 K. The precipitates were divided into two main types: mixed type and single type. ACKNOWLEDGEMENTS This research is supported by the National Natural Science Foundation of China (Grants No. 50471015). REFERENCES 1. M. K. Kulekci, Int. J. Adv. Manuf. Technol. 39, 851 (2008). 2. H. Furuya, N. Kogiso, S. Matunaga, and K. Senda, Mater. Sci. Forum, 350-351, 341 (2000). 3. L. Gaines, R. Cuenca, F. Stodolsky, and S. Wu, Proceedings of the Automotive Technology Development Contractors Coordination Meeting, Society of Automotive Engineers (1995). 4. K. Hono, C. Mendis, T. Sasaki, and K.Oh-Ishi, Scripta Mater. 63, 710 (2010). 5. Y. Kawamura and M. Yamasaki, Mater. Trans. 48, 2986 (2007). 6. D. Egusa and E. Abe, Acta Mater. 60, 166 (2012). 7. T. Kiguchi, Y. Ninomiya, K. Shimmi, K. Sato, and T. J. Konno, Mater. Trans. 54, 668 (2013). 8. A. Inoue, Y. Kawamura, M. Matsushita, K. Hayashi, and J. Koike, J. Mater. Res. 16, 1894 (2001). 9. X. H. Shao, Z. Q. Yang, and X. L. Ma, Acta Mater. 58, 4760 (2010). 10. B. Chen, D. L. Lin, X. Q. Zeng, and C. Lu, J. Alloy. Compd. 440, 94 (2007). 11. J. Becker, B. Fischer, and K. Schemme, Magnesium Alloys and Their Applications, p.15, Werkstoff-Informationsgesellschaft mbH, Frankfurt (1998). 12. 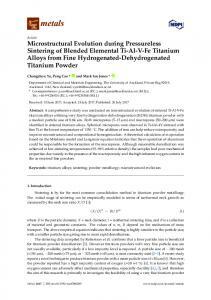 Y. Chen, Q. Wang, J. Peng, C. Zhai, and W. Ding, J. Mater. Process. Tech. 182, 281 (2007). 13. K. Nair, M. Mittal, R. Sikand, and A. Gupta, Mater. Sci. Technol. 24, 399 (2008). 14. D. Q. Li, Q. D. Wang, W. J. Ding, J. Blandin, and M. Suery, Trans. Nonferr. Met. Soc. China 20, 1311 (2010). 15. S. Xu, M. Zheng, S. Kamado, K. Wu, G. Wang, X. Lv, Mater. Sci. Eng. A 528, 4055 (2011). 16. T. Homma, C. L. Mendis, K. Hono, S. Kamado, Mater. Sci. Eng. A 527, 2356 (2010). 17. W. F. Hosford, Mechanical Behavior of Materials, pp.7075, Cambridge University Press, New York (2005). 18. M. Shahzad, Ph. D. Thesis, p.2, TU Clausthal (2010). 19. B. Chen, D. L. Lin, X. Q. Zeng, C. Lu, J. Mater. Eng. Perform. 22, 523 (2012). 20. B. Chen, D. L. Lin, X. Q. Zeng, C. Lu, J. Mater. Sci. 45, 2510 (2010). 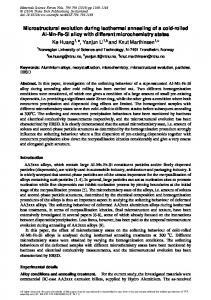 Report "Recrystallization and Microstructural Evolution During ... - Springer Link"